The Addax is a critically endangered desert antelope. They have a body length between 1.5 and 1.7 m (5 - 5.5 ft), a tail length between 25 and 35 cms (10 - 14 inches) and they weigh between 60 and 125 Kgs (130 - 280 lbs). Their coat is a grey/brown colour in winter and sandy/white in summer. Their chest, neck and head are mainly brown with a white patch over the bridge of their nose and around their mouth. Both males and females have horns, each having two twists and they measure between 80 and 120 cms (31.5 - 47.2 inches). Addax have broad hooves with flat soles and strong dew claws to help them walk on areas of soft sand. Addax are mainly active at night and they spend their days resting in depressions that they dig. 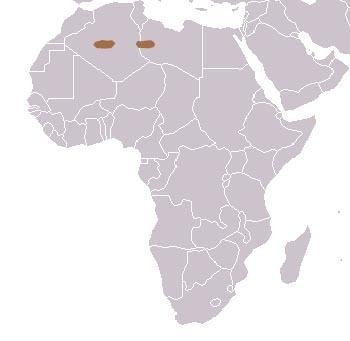 Addax are found in isolated regions of the Sahara. They either live alone, or in small groups of 2 - 4 individuals that contain both males and females. A few days prior to giving birth a female Addax will wander away from the group and she will usually be accompanied by a male. They will stay away for a while then they will re-associate with the group once again. The Addax mainly grazes on coarse desert grasses but when grasses are scarce they will eats acacia species and leguminous herbs. Addax rarely need to drink as they get the moisture they require from their food. After a gestation period of approximately 300 days, 1 calf will be born. Birthing will take place between September and January, following the rainy season but before the cold season begins. Addax reach sexual maturity at approximately 2 years of age. Humans are the main predator of the Addax. There are no subspecies of the Addax. 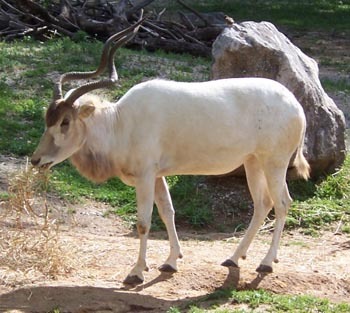 The Addax is extremely rare in its native habitat but it is quite common in captivity. One of the largest captive breeding herds is at Hanover Zoo in Germany.